Come on in and visit an isolated place hidden way back in the wilderness mountains of the Cumberland Plateau that used to be a bustling logging and mining town beside a main railroad here in Tennessee. Traveling back to Gernt with Granny! 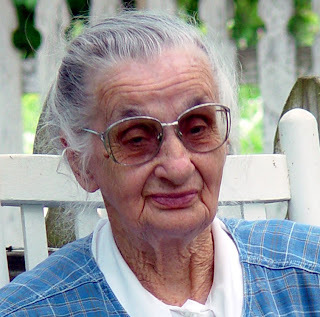 *Leda Roysden died this summer June 3rd 2015 at 100 yrs old and 6 months. She left behind a wonderful legacy for her grand-kids and great grand-kids. I became fascinated by stories I heard Granny, Leda Roysden, tell about her childhood in Gernt- a place that no longer existed- and decided to do research and write a book to bring back a forgotten era of my granddaughter’s legacy. One Saturday my husband and I decided to find Gernt. Fifteen miles from our home, Gernt is located in the wilderness of the Big South Fork. Despite the hardship to reach our destination, we were enthralled by the unique beauty of the mountains and valley that enclosed Gernt where wild ferns and flowers grow twice their normal size. While there I could hear echoes of the past in the White Oak Creek as it danced over rocks, in the vast stillness broken only by the chirping of birds, see it in the butterfly’s wings as they fluttered over clumps of wild flowers along the trail, and hear it in the wind that whispered through the treetops of days gone past. In this same spot a little girl played on a triangle of railroad tracks close to the house where she lived. Her mother washed the family’s clothes in a nearby branch that flowed into the White Oak Creek, which ran along the valley floor. Her home was a short distance above the railroad triangle on the side of a mountain near Groom Creek. This small girl grew up hearing the shrill blast of the train whistle twice a day as it echoed off the towering mountains along with the high whine of the sawmill cutting logs into lumber while black smoke floated across the valley from huge burning slab wood piles. She learned to swim in the White Oak Creek, playing along the creek bed, and often walked with her mother and sisters, not quite a mile up the valley, to East Laurel where the post office and general store was. For over eighty years Granny wanted one more time to go back to the place of her childhood. It would be too far to walk as what was once the main hard-packed wagon road now takes a four-wheel drive vehicle to traverse, but I was determined to someway get ninety-two-year- old Granny back one more time to Gernt. Plans were made and a generous friend of ours, Joe Reed, from Sunbright loaned us his large four-wheel drive truck and two 4-wheelers for the journey. Our daughter and her family came to spend a mini fall vacation the Saturday before our trek to Gernt. While traveling around on the other side of the ridge they found Zenith- a place on the White Oak Creek a couple of miles from Gernt. The next morning they went back to Zenith taking Granny and me. Granny was thrilled to see the White Oak Creek once again. While we explored along the White Oak Creek, Granny showed her great grandson, two-year-old William, how to skip stones in the rippling creek. We found old railroad timbers of the train track that used to run through the area and part of a rail that was twisted. We left Zenith and drove to Honey Creek where there is an overlook of the Big South Fork Cumberland River. Due to the dry summer conditions the riverbed was quite low. I took a picture of a profile of Granny’s face as she gazed over the wooden rail at the overlook. It was easy to envision an ancestor of Granny's, Cherokee Princess Cornblossom Doublehead standing at the very same spot in years past. Saturday morning four generations: Granny (Leda Roysden) from Jamestown; her daughter and husband (Judy & Randal Moore) from Nashville; our daughter, Dawn, her husband, Randy Moore, and their two children, Annette and William also from Nashville; our son, Dwight, my husband, and I from Jamestown started our excursion back to Gernt. The excitement on Granny’s face made our day. We first stopped by the Alticrest cemetery, which was the main cemetery for Gernt, where a lot of the Roysdens are buried. About a half a mile up the road we turned off at the Cumberland Valley trailhead of what was the old Gernt road. We parked our vehicles and unloaded the two 4-wheelers. It was a gorgeous autumn day. Trees were ablaze with fall colors in the brilliant sunshine as if to welcome Granny back home. I was busy snapping pictures of this historic moment as we headed down the trail. A lot had changed in over eighty years. Granny gazed eagerly around through the open windows of the truck cab where she was seated in the middle between Dwight and me. The hard wagon trail was now churned up quite soft in spots from the many horses using the trail. We hadn’t gone far before a group of horses were spotted coming towards us. Our drivers cut the engines on the four-wheel vehicles to let the horses pass without spooking them. The narrow road wound up over rock boulders and across flat winding areas along the top of the ridge enclosed by strands of tall trees. Our vehicles moved slowly through the rugged wilderness as we tried to absorb all the wild beauty around us. Part way down the trail we stopped at a spot where there was a clearing showing hints of where a house once stood; the only evidence of past civilization left was clumps of flowers planted in rows that at one time graced a front yard. A storm with high winds had hit our area recently so I wasn’t surprised to see a small tree lying across the road. A bit further on a larger tree had fallen that was too big to move so the fellows maneuvered one of the 4-wheeler’s around to hook up to the tree. As I watched the fellows strain to push the tree to the side of the trail with the four-wheeler it was easy to imagine a settler in days gone by clearing a path for his wagon. At last we reached an open area close to the spot of what is now called the Laurel Fork Overlook. We walked the short distance to the overlook, which mainly consists of an enormous rock jutting out into space- part of the many cliffs and bluffs that overlook the winding valley below. Majestic mountains on either side rise as far as the eye can see. The magnitude of infinite space takes one’s breath away at first sight. Only the guys were brave enough to venture close to the edge of the rock that has no protective railing. Then we headed back to the spot that would lead us down the mountain side to Gernt. Granny stopped to rest on a fallen tree to catch her breath for a minute. At the head of the trail we took another break. While the adults discussed amongst themselves, my grandson, two-year-old William became bored and squatted down to play in the sand. The look on his face says it all. Memories are okay for grown-ups, but give me something I can do with my hands! The narrow trail, once the main road to Gernt, sloped sharply down the side of the mountain to the valley below. Huge bluffs of rocks rose above us on one side while the mountain fell away on the other side scattered with trees to give one a slight marginal feeling of safety. Descending down the trail we went along the steep side of the mountain as we headed towards the valley floor. Five-year-old Annette was walking, sometimes running, and stumbling to stay close to the 4-wheeler I was riding behind my husband (due to my poor health) while Dwight took Granny on the other one. We asked Annette if she didn’t want to ride, but she was having too much fun walking behind us. As we slowly descended around another sharp downward curve it came to me vividly that this was the very road Granny, at my granddaughter’s age, once walked to attend school. We stopped for a moment to let those walking catch up. Annette’s dark brown eyes widened when I asked her how she would like to walk up and down the mountain each day to go to school. She was huffing for breath but answered seriously, I think I’d get awful tired if I had to do it everyday. It’s an awful long ways. We finally reached the valley floor and spotted a well casing still standing that used to supply water for the Gernt community. We could hear the sound of the White Oak Creek through the trees. We had brought along an old picture Granny had of Gernt years ago- the picture at the top of the page- to help us. What once had been an open lumberyard for the O & W Railroad was now all grown up in trees and underbrush except for the railroad bed. Some of our group searched the side of the mountain and discovered rocks piled together of what used to be a springhouse for a family. Granny spryly clambered up the side of the mountain to see ignoring our attempts to help telling us, I’m alright. I can make it. The many years that had passed and changes confused Granny. Granny wasn’t the only one confused as we tried to decide which direction Oneida was. The problem was solved when my daughter, Dawn pulled out a compass. Before exploring further we decided to stop and eat the lunch we had packed along. Knowing we would be in the wilderness we had brought a simple lunch of sandwiches, chips, and our own drinks. We used large rocks to set out our food. As us grown-ups stood around eating our sandwiches, talking, and asking Granny questions, I noticed my two grandchildren seated on a rock at our feet eating and couldn’t resist taking their picture. Walking up the railroad bed we headed towards what was known as the railroad triangle. We were hoping that once Granny got her bearings she would lead us to the spot where she had lived. She kept saying if she could see the cliffs she would know where her house had stood. She got excited when we reached the triangle of the railroad. We crossed a couple of branches to get to the White Oak Creek thinking that we would have to cross it as Granny always said she lived across the creek. The White Oak Creek was filled with sparkling diamonds of water as it skipped over the rocks in the bright sunlight. The fellows were busy figuring a path across the rocks for all of us to follow when Judy asked Granny if she could recognize where her house would have stood from across the creek. To our shock Granny replied, It’s not this way. Our house was back there somewhere. We circled around Granny all talking at once as poor Granny stood bewildered in the middle. I had a brainstorm and shoved the small tablet I was carrying to make notes on into Granny’s hand. Show us where your house was, Granny. Without hesitation she took the pen I offered and began drawing a map of the area starting with the White Oak Creek. We scrambled back up the bank through the briars we had just come through and headed towards the railroad triangle. After crossing a small stream (the creek) Granny pointed to the mountain that rose ahead of us. It’s up there somewhere where our house stood. My husband asked for any details that she could remember. The others started climbing while Granny and I waited below catching our breath. A little ways up I could see a level spot before the mountain rose again. Then Dana spotted a path a short distance above that. We knew we had found the spot. Energized we started up the side of the mountain. Granny’s plain-board house had stood up against the mountain with a flat yard in front and a path out the back door to the spring where they got their water. When Granny stood in the spot and looked around she said, This is it. This is where the house stood. Although nothing remains of a house some eighty years later there was a feeling of awe as we all stood in the spot where Granny had once lived trying to see the area through a little girl’s eyes. Then my daughter, Dawn, called out, Look up through the trees! There are the cliffs Granny said she could see as a girl! Following to where her finger pointed we could faintly see cliffs high above us through the treetops. In Granny’s day, with the sides of the mountain logged out, the cliffs would have been easy to see. Granny had come to a full circle in time. Over eighty years later the little girl, Leda Roysden, had come home again. Gernt today is in an isolated valley secluded deep in the Cumberland Plateau with horse trails crisscrossing where once a thriving logging community lived. Only a couple of sentences about Gernt are found in local history about one of the main railroad junctions back in the early 1900's where wagon loads pulled by mules filled with sawn lumber logged off of the mountains slowly made their way down steep trails. Transcars bulging with logs were also lowered over veritcal bluffs by heavy wire. The lumber was then stacked along the railroad track waiting to be loaded into the boxcars of the O & W railroad where it would then be shipped out by train for miles beside the winding White Oak Creek to Oneida, as well as coal that was mined out of the mountains.